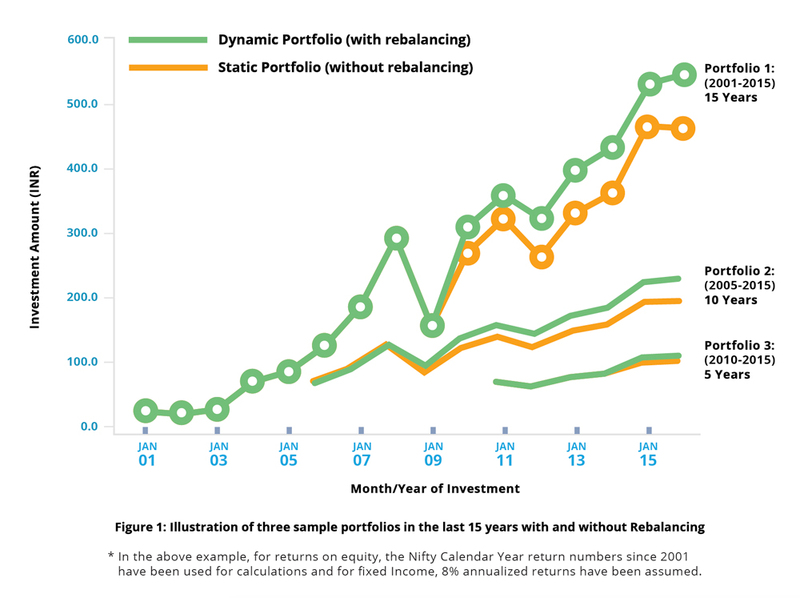 Diversification is the most commonly applied strategy to balance risk in asset allocation. Spreading investments over various asset classes to attenuate risk is a tactic that almost everyone follows. However, simply applying the strategy based on your risk profile alone doesn’t do the job. Deviations that are not monitored can open up your family’s wealth to risk of underperformance and capital erosion. To ward off such risks, you need to put in place a meticulous reviewing and rebalancing strategy. Here’s an illustration of how rebalancing works. Consider a 50:50 mix of equity and fixed income over different time periods in the last 15 years. In all the cases, as demonstrated by the line chart below, a dynamic portfolio which was maintained and rebalanced every year was capable of producing higher returns than a static portfolio. The implication: If you had invested INR 1 Crore in 2001 with the aforementioned 50:50 mix of equity and fixed income, that investment would be worth INR 5.40 Crore in 2016, had it been dynamically rebalanced every year. 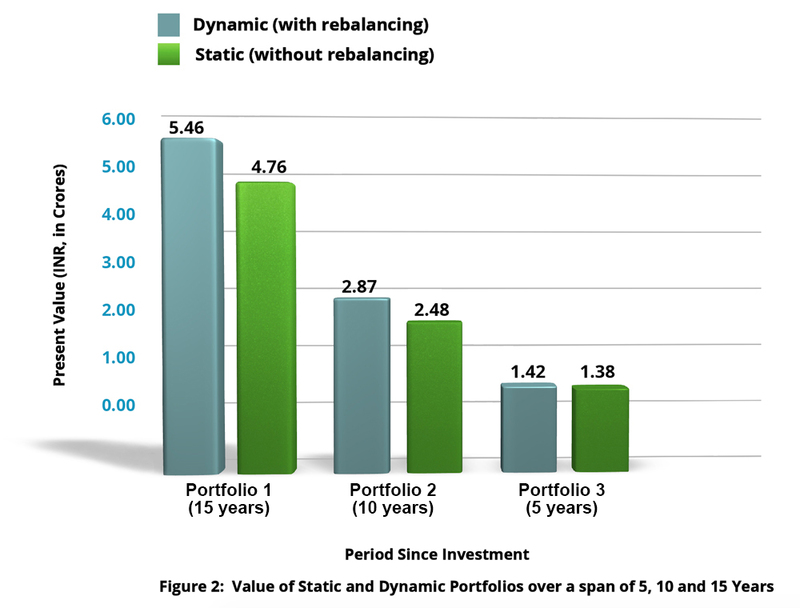 In the absence of rebalancing, a static portfolio would only be worth INR 4.70 Crores, underperforming by INR 70 lakhs. The above cases are essentially arguments in favor of maintaining an asset allocation strategy based on factors that best match your individual criteria, including time and risk tolerance. Most importantly, family assets and investments are often maintained in silos and this can create a blind spot. Vital information is fragmented across a variety of documents and spreadsheets and you don’t really get a clear picture on your allocation. Asset Vantage makes this task less cumbersome and daunting through a comprehensive application suite. With anytime-access to insightful analytics you can analyze changes in asset allocation over time and across sectors, advisors, groups and entities. This helps you to get a better and holistic view of your rebalancing needs. Moreover you can also overlay these insights with annualized returns and compare them with benchmarks when investment opportunities are presented to you. Not only will this help you gear up with all the right questions for your advisor, it will ensure you always have your finger on the pulse. You can now maintain a diligent and dynamic asset allocation strategy with Asset Vantage.